MIAMI (AP) Marlins third baseman Martin Prado was sidelined Friday night by a left hamstring injury, the latest in a series of leg issues threatening his career. Prado left Miami’s game against Washington after he pulled up limping while running out a grounder in the sixth inning. Hamstring and knee injuries limited Prado to 37 games last year, and he missed the first month of this season recovering from right knee surgery. ”It has been a difficult year and a half for me,” said the 34-year-old infielder. Prado had hits in his first three at-bats against Nationals ace Max Scherzer, and reached on an error when he was hurt. 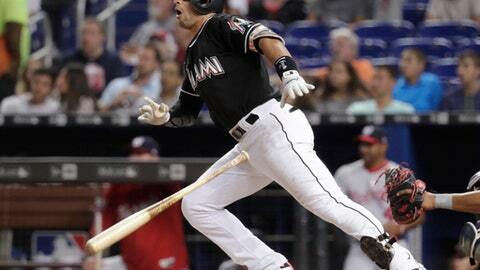 Miami manager Don Mattingly said Prado’s latest injury was especially deflating for the Marlins.